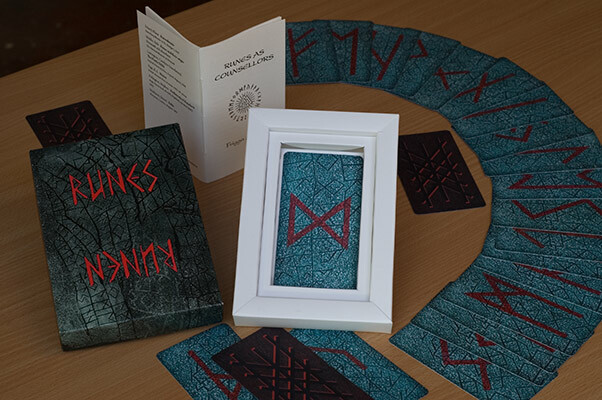 The hand printed rune cards by the Finnish artist Marjatta Ranta-Iso are available in offset print. Each of the 24 Elder Futhark runes Marjatta has handcrafted in wood, gouged with an etching needle and blockprinted on an aquatint. On the back of the deck is a blockprint of Yggdrasil, the world tree. The deck and guidelines comes in a high quality box. Frigga Asraaf is the author and the guideline booklet has been published in Dutch, English, German and Finnish. Each deck is available with a booklet in one of these languages. Choose which one you want on the order form. The short poems by Frigga serve as a support to memorize the meaning of each rune. A brief history and mythology is included. How to use the cards: Shuffle the cards or spread them out and mix them up. Then pick up either three, seven or nine cards depending on which layout you choose. Turn them over and lay the cards out in the order you picked them. 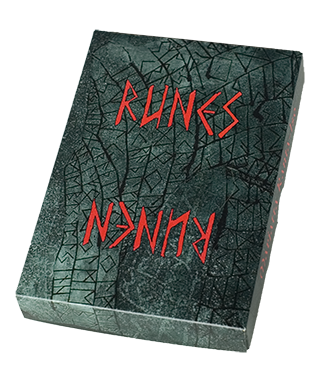 Then look up the meaning of the rune in the booklet. Design, layout and editing was done by Hans Kromme. Please use the order form for your purchase. The booklet is available in English, German, Dutch, Finnish and Swedish.